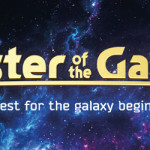 Home » News » Announcements » Master of the Galaxy: new stretch goal unlocked, contest on BGG and live demo! Master of the Galaxy: new stretch goal unlocked, contest on BGG and live demo! The Master of the Galaxy Kickstater campaign enters in its 10th day unlocking the third stretch goal, with over $27,500 pledged: a new exclusive Species card will be featured in the Kickstarter edition of the game - the Wanderers. This week, a BGG Contest is running, offering the chance of win a copy of Master of the Galaxy, and today, July 27th, a demo live will be held on Tabletopia at 10 PM EDT (Eastern Day Time) - or July 28th 2 AM UCT. 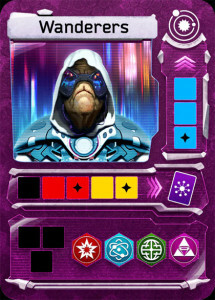 New species card added to Master of the Galaxy: the Wanderers. Since the project launched, on July 18th, other two stretch goals has been achieved, unlocking a new leader, Baron Duque, and the Deluxe Supremacy Board, to be added to the Kickstarter Edition of Master of the Galaxy. The next goal - at $ 30,000 - will add silk-screen printing to customize the four cloth bags included in the game. The demo live is a good chance to learn about the games, using the resources of Tabletopia Learn & Play series, and to participate, players are welcome to register - click here. The Master of the Galaxy BoardGameGeek Contest is online and will run until July, 30th. BGG members have the opportunity to win a copy of the Deluxe Edition of the game or, in the case of participants who are already a KS backer, a copy of another Ares Games’ Euro or Thematic game, choosing among Aztlán, Inkognito, Odyssey – Wrath of Poseidon, or Last Friday. For more information about Master of the Galaxy and to pledge, visit the Master of the Galaxy project on Kickstarter and the game’s page on Ares Games website, and follow the Master of the Galaxy’s page on Facebook.